62 MARCH 2015 COATINGSPROMAG.COM Te crew also set up safety fagging and stanchions six feet (2 m) from the perimeter to serve as warning lines and to mark the perimeter. Once work was completed in a particular perimeter area, the tie-of points were removed and installed in the next perimeter section. And, according to Bradigan, the crew wore boots, long-sleeved shirts, safety glasses, cut-resis- tant gloves, refective vests, and long pants anytime they were working on the jobsite. "Hard hats were also worn when we were loading and unloading any material or equipment on and of the roof deck," said Bradigan. Repair, Repair, and More Repair After two weeks of intense roof cleaning, the team was ready to take on the next phase of the job: spot repair. A ll cracks, holes, splits, and bad seams were repaired using ERSystems' OneStep Adhesive Sealant. ERSystems' OneStep Adhesive Sealant is a high-performance reactive silyl-modifed adhesive sealant. It is a one-component moisture-cure sealant that has fexibility, excellent adhesion properties, and is resistant to ultraviolet and infrared radiation. "In areas that were in particularly bad shape, we also used polyester mesh material in conjunction with the adhesive sealant," said Bradigan. Te crew also installed one-way moisture-relief vents into the roof system in areas where wet substrate was discovered. Moisture-relief vents allow air and moisture to escape, but they do not let moisture get back into the roof system. " To install these one-way vents, we cut a hole in the membrane and then sealed it in with repair mesh," stated Bradigan. Repair work continued on the roof deck with the application of ERSystems' hydrocide elastomeric roofng (H.E.R.) urethane mastic to encapsulate wall, pipe, and curb fashings that were damaged. 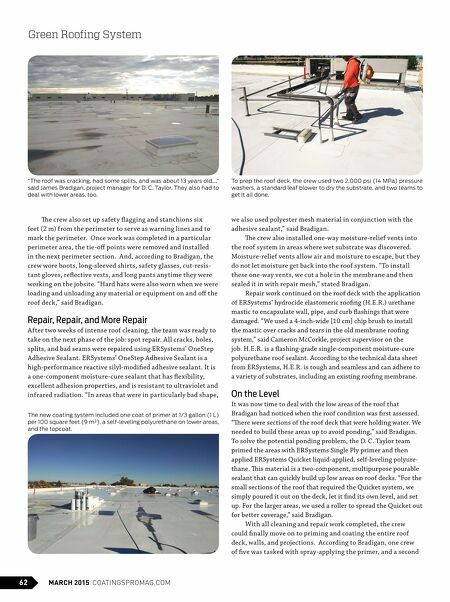 "We used a 4-inch-wide [10 cm] chip brush to install the mastic over cracks and tears in the old membrane roofng system," said Cameron McCorkle, project supervisor on the job. H.E.R. is a fashing-grade single-component moisture-cure polyurethane roof sealant. According to the technical data sheet from ERSystems, H.E.R. is tough and seamless and can adhere to a variety of substrates, including an existing roofng membrane. On the Level It was now time to deal with the low areas of the roof that Bradigan had noticed when the roof condition was frst assessed. "Tere were sections of the roof deck that were holding water. We needed to build these areas up to avoid ponding," said Bradigan. To solve the potential ponding problem, the D. C. Taylor team primed the areas with ERSystems Single Ply primer and then applied ERSystems Quicket liquid-applied, self-leveling polyure- thane. Tis material is a two-component, multipurpose pourable sealant that can quickly build up low areas on roof decks. "For the small sections of the roof that required the Quicket system, we simply poured it out on the deck, let it fnd its own level, and set up. For the larger areas, we used a roller to spread the Quicket out for better coverage," said Bradigan. With all cleaning and repair work completed, the crew could fnally move on to priming and coating the entire roof deck, walls, and projections. 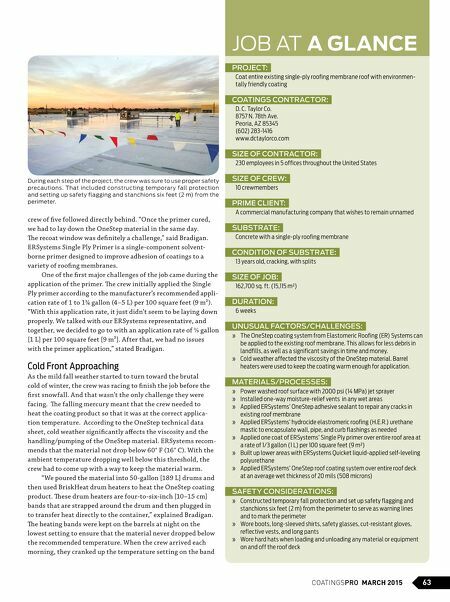 According to Bradigan, one crew of fve was tasked with spray-applying the primer, and a second Green Roofing System "The roof was cracking, had some splits, and was about 13 years old…," said James Bradigan, project manager for D. C. Taylor. They also had to deal with lower areas, too. The new coating system included one coat of primer at 1/3 gallon (1 L) per 100 square feet (9 m²), a self-leveling polyurethane on lower areas, and the topcoat. To prep the roof deck, the crew used two 2,000 psi (14 MPa) pressure washers, a standard leaf blower to dry the substrate, and two teams to get it all done.